Governor Bill Anoatubby signed the proclamation making May 1 Silver Star Banner Day. "I believe it is our duty as a MOAA Chapter to promote and assist those organizations who give support to our military personnel. We have not participated in this type of activity recently, so it is with great pleasure that I announce our guest speaker for October. She is Diana Creed Newton, Co-Founder and Treasurer of "The Silver Star Families of America". This organization with a worldwide reach has their headquarters in our own backyard, Clever, MO. 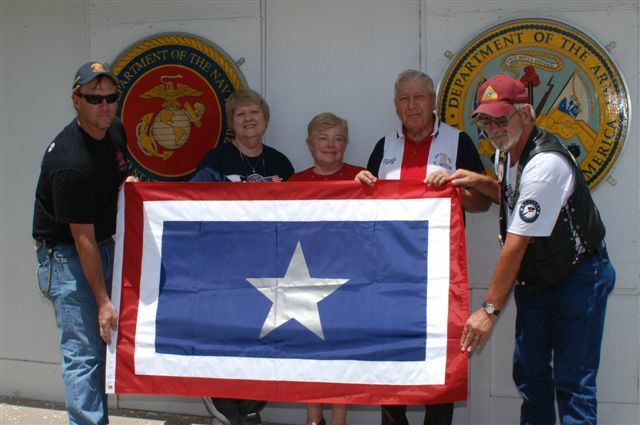 Their mission is to honor and assist ourwounded in combat service members with banners, flags, certificates, and other amenities. 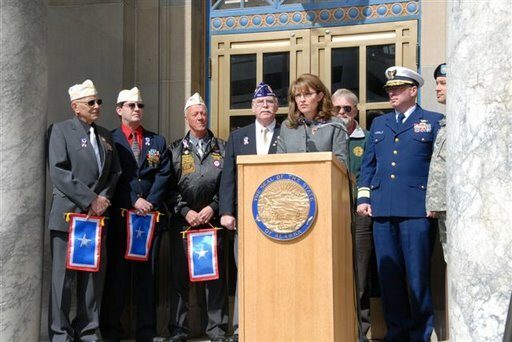 In addition to honoring Purple Heart recipients, they recognize victims of friendly fire, those suffering fromPTSD, Agent Orange effects, and Gulf War Syndrome.This organization performs a tremendous service for our wounded vets." 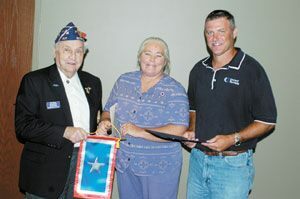 ENDORSED SILVER STAR BANNER DAY AND HONORED WOUNDED AND ILL VETERANS BY PRESENTING THEM WITH SILVER STAR BANNERS More . . I would be more that Happy to do the proclamation. Do you have a national proclamation form. We can not do enough for those who have done so much for us. We will be proud to give this endorsement and proclamation. Councilman Ryman and I have begun the process of passing this resolution. I expect full support and I am honored to be a part of making this happen. Thank you for your email. 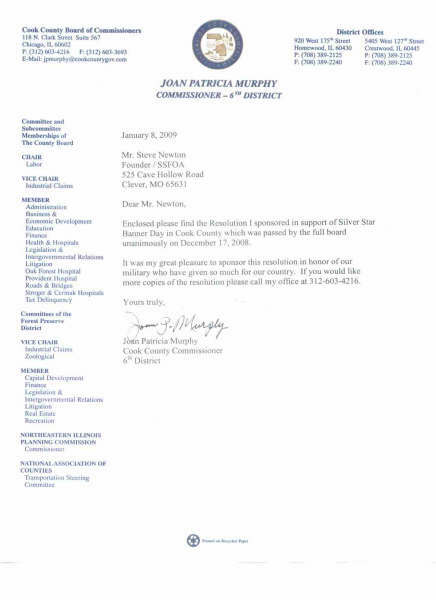 I have forwarded your proclamation request to City Council and Mayor Brenner and am pleased to inform you that all have agreed to consider your request in proclaiming Silver Banner Day in the City of York, Pennsylvania! Thank you for inviting the City of York, PA in joining with other municipalities in honoring our wounded armed forces members! Thank you for the correspondence, Though I am aware of many organizations and individuals that are doing all they can for our troops, I must admit I did not know of yours, therefore I am grateful for your email. Myself and the city council will be proud to have a Resolution prepared for your organization and the individuals that are working so hard in their efforts to support our troops. The City Manager has been directed to make this happen! Thank you for including us in this important movement. 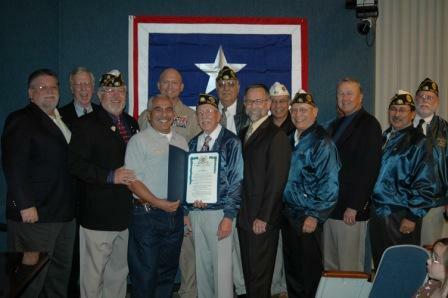 The City of Santa Barbara has several initiatives for the veterans and we would be honored to also pass this one. I will see how soon we can get this out to you. Thank you for your work in this area. It is a very important thing that you are doing. The City of Fredericksburg, Virginia, is proud to honor your request for a Proclamation. Please find York City Council Resolution No. 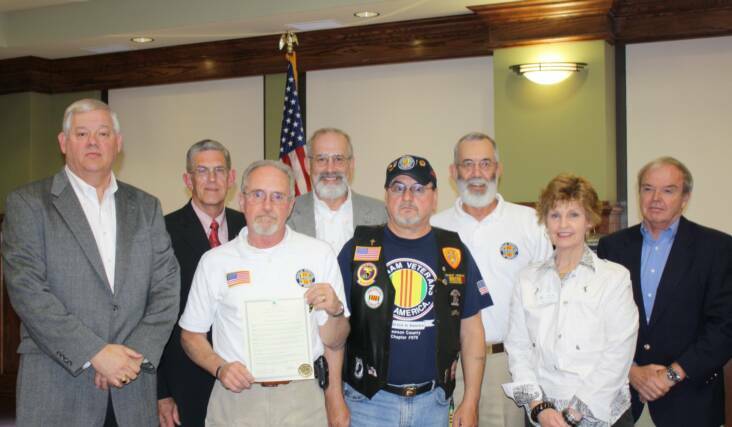 116, adopted unanimously at Council's August 19th meeting, proclaiming May 1st as Silver Star Banner Day in the City of York, Pennsylvania. On behalf of the Members of York City Council, THANK YOU for your commitment to serving our wounded and ill Armed Forces members and we are honored to take part in this historic collaboration. Thank you for giving Havre de Grace, Maryland the opportunity to participate in this wonderful event to recognize and remember the wounded and ill of our Armed Forces. We are honored to do so. Today is Silver Star Day - a national day set to officially remember and honour all the wounded troops in America, from any war. 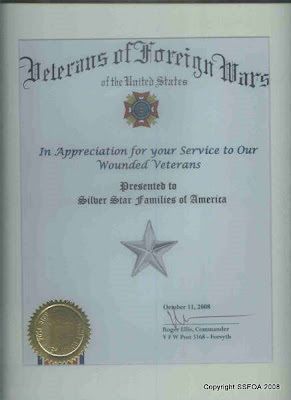 Silver Star Families of America is a group that nobody volunteers to join, but they are very active in their mission of making sure that EVERY wounded is honoured. Trish, it is we that owe our sincere thanks to you and your organization for all that you do for our wounded service men and women -- and their families. It's great to know that you all form part of such a varied great support network that our Purple Heart recipients can call upon in time of need. I'm glad we had the "distribution network" in place to assist Bonnie in getting this great donation into the hands of those who could maximize its usefulness. The willingness with which our young are likely to serve in war, no matter how justified, shall be directly proportional as to how they perceive the veterans of earlier wars were treated and appreciated by their nation. I would like to commend the Silver Star Families for their efforts and leadership on this honorable program recognizing our wounded and ill soldiers/vets. My brother served our country in 2004-2005 in Afghanistan US Army National Guard’s and lost some of his hearing from his time spent there during Operation Enduring Freedom which is ongoing today. MOTION by Council Member Holman, seconded by Council Member Klein to adopt Resolution No. 08-10/1-1 proclaiming Silver Star Banner Day in the City of Baxter on May 1, 2008. Motion carried unanimously. As public relations director for the Forty and Eight Veterans Organization which has been in existence since 1923 and presently has 26,000 members, I am proud to recognize what your organization is doing not only for active duty military personnel but also for veterans who were wounded in action, for those who will forever suffer from severe service related injuries and for those who died in the line of duty. 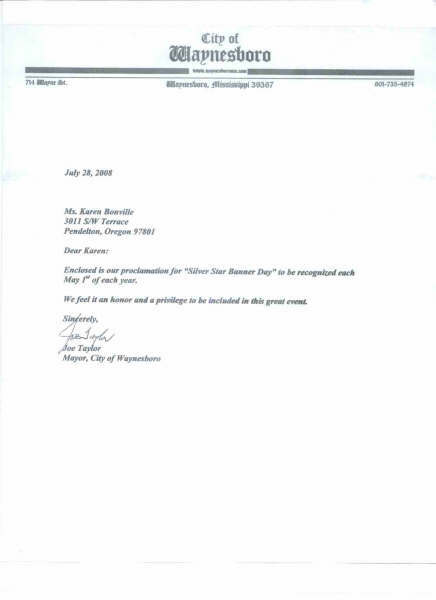 I sincerely hope that communities across this country will declare 1 May 2009 “SILVER STAR BANNER DAY” and in that regard I am sending a copy of this letter to the various communities that my local Voiture serves, asking the mayors of these towns to so declare 1 May 2009. We join with you in honoring and remembering our wounded warriors with the presentation of SILVER STAR BANNERS and letters to them and their families. God bless you and your efforts. 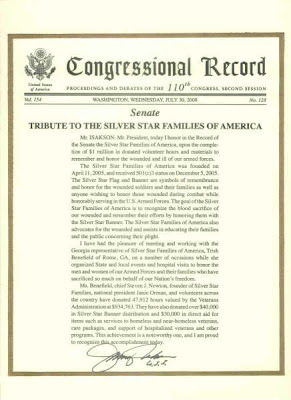 WASHINGTON, July 10, 2008 – Two years ago, Steve Newton, founder of Silver Star Families of America, asked the governors of all 50 states and the mayor of the District of Columbia to sign a proclamation to observe May 1 as Silver Star Banner Day, honoring wounded and ill servicemembers from all wars. Governors held ceremonies honoring wounded and ill servicemembers, Newton said, but the news was not always reaching small cities and towns. They, too, wanted to get involved. 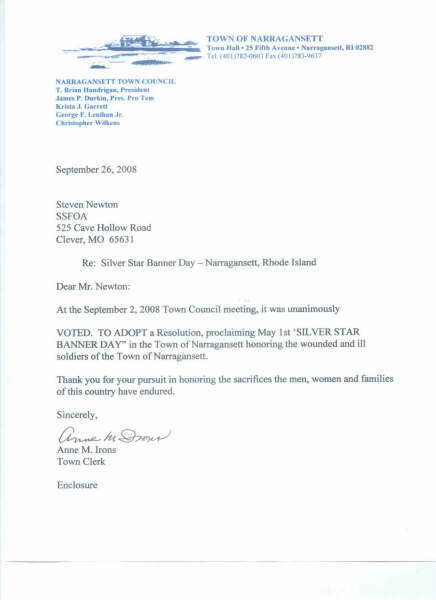 That feedback led Newton to reach out to 5,000 cities and towns -- 100 per state -- across the nation in preparation for next year’s Silver Star Banner Day. 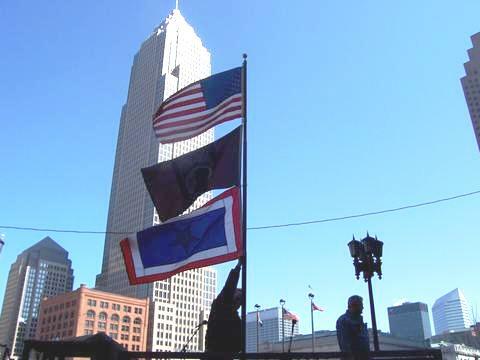 May 1 was chosen for this recurring event because it is Loyalty Day and the first day of Military Appreciation Month, Newton said. 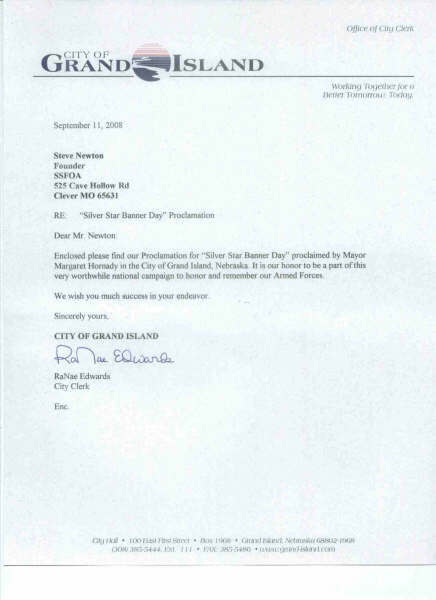 A Silver Star Families of America committee contacts city clerks and mayors to inform them of the event and to ask for their participation. 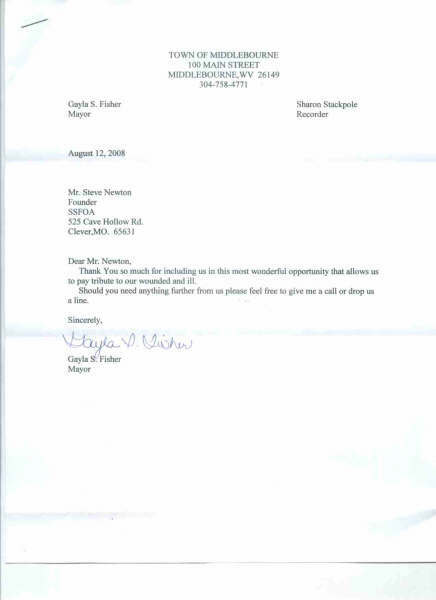 When they agree, they receive a proclamation letter to sign. 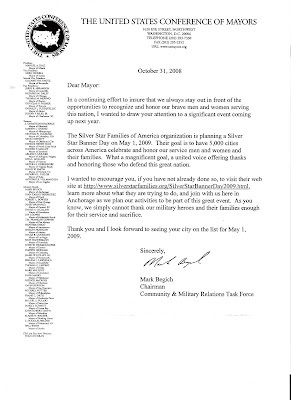 To date, nearly 60 cities in 18 states have signed on to observe Silver Star Banner Day in 2009 and thereafter. The organization’s Web site, www.silverstarfamilies.org, is the place to start for people who want to ensure their community has the opportunity to participate. Silver Star Families of America is a supporter of America Supports You, a Defense Department program connecting servicemembers and their families serving at home and abroad. The Town of Islip, New York, will be happy to participate. We will send a Proclamation to the address listed. Thank you for including us in your wonderful cause. We will be happy to issue this proclamation and take part in this special day. Thank you for all that you do to honor and support our wounded veterans. We replaced the blue star flag that was in the window of our home with a silver star flag when our son came home as a wounded and disabled veteran of the Iraqi war. 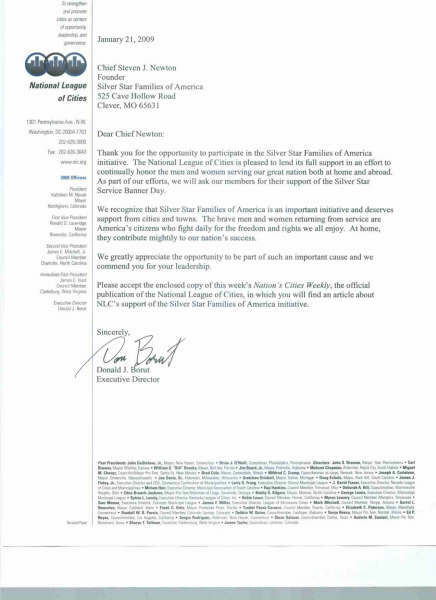 States, cities, towns, counties show yoUr support and participate in the largest THANK YOU to wounded and ill service members by signing the 2009 SILVER STAR SERVICE BANNER DAY proclamation. It will be displayed in a place of honor in the Stars and Stripes Museum to remind America of the Heroes who sacrificed in blood, body and mind for or freedoms. Due to the high demand, the SSFOA will accept proclamations year round. Please note if you have signed a "permanent" proclamation you dont need to send in another each year. Over 1000 cities and counties have signed so far in support of setting aside a day to honor wounded and ill Veterans of all wars. Please join the whole nation as we move forward to see 5000 cities, and counties honor our wounded and ill EVERY year on May 1. 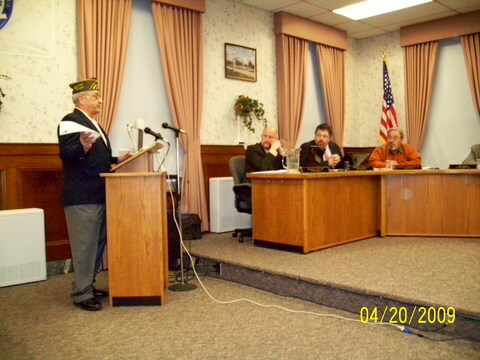 AmVets Commander from Chapter 2497 requested and was presented the Official Proclamation for mounting in a frame......great job by the Alpena Mayor and City Council.